Please click on the button marked "I Accept" at the end of these Terms and Conditions if you accept them. Please understand that if you refuse to accept these Terms and Conditions, you will not be able to order any Products from Our Website. "Working Day" means a day other than a Saturday, Sunday or public holiday in England when banks in London are open for business. Our products can currently only be ordered by people resident in the United Kingdom, Southern Ireland and the Channel Islands. We do not currently accept orders from addresses outside of these areas. you are accessing Our Website from the United Kingdom, Southern Ireland or the Channel Islands. After placing an order, you will receive an e-mail from Us acknowledging that We have received your order. Please note that this does not mean that your order has been accepted. Your order constitutes an offer to Us to buy a Product. All orders are subject to acceptance by Us, in Our sole discretion, and We will confirm such acceptance to you by sending you an e-mail and a letter in the post confirming that the Product(s) ordered by you have been accepted by Us (together the "Order Confirmation"). In the event that you receive only an e-mail or a letter this will still for the purposes of these Terms and Conditions constitute a valid Order Confirmation. The contract between us will only be formed when We send you the Order Confirmation (the "Contract"). We reserve the right to refuse to accept any submitted order. The Contract will relate only to those Products We have confirmed in the Order Confirmation. We will not be obliged to supply any other Products which may have been part of your order until the order of such Products has been confirmed in a separate Order Confirmation. Whilst every effort is made to ensure a clear description of the Products We sell on Our Website is provided, there may be slight variations in size, shape and colour shown. Illustrations and descriptions supplied on Our Website are for guidance only. We reserve the right from time to time to vary the nature of the Products advertised without notice to you provided these variations do not materially alter the Products sold. Our Website contains a number of Products and it is always possible that, despite Our best efforts, some of the Products listed on Our Website may be incorrectly priced or showing as "In Stock" when they are no longer available. In the case of the latter instance, a member of Our sales team will contact you regarding this. If you are contracting as a consumer, you may cancel a Contract at any time within 2 working days after placing the order. In this case, you will receive a full refund of the price paid for the Products in accordance with Our refunds policy set out in clause 11 below. In order to cancel a Contract in accordance with clause 7.1 above, either e-mail Us at hello@bluefeatherdesigns..co.uk or write to Blue Feather Design Studio, 294 Oldfield Lane, North, Greenford UB6 8PS quoting your order number and reason for your cancellation (the "Cancellation Notice"). The Products subject to the Cancellation Notice must be returned to Us and will only be accepted for an exchange or refund provided they have (i) not been used; and (ii) are returned in the same condition in which the Products were delivered in, including being in their original packaging. Please return the Products to Us as soon as reasonably practicable, ideally within 10 Working Days of the Delivery Date but in any event within 14 Working Days of the date We confirm receipt of your cancellation request. The return of any Products will be at your own cost. You have a legal obligation to take reasonable care of the Products while they are in your possession. If you fail to comply with this obligation, We may have a right of action against you for compensation. Returns and cancellations cannot be accepted for any bespoke or commission based work. Details of your statutory right of cancellation, and an explanation of how to exercise it, are provided in the Order Confirmation. This provision does not affect your other statutory rights as a consumer. The Products you have ordered will be delivered to you in the agreed timescale on receipt of the order. This agreed day will be for the purposes of the Contract and these Terms and Conditions, the "Delivery Date". If you fail to contact us and no Delivery Date is agreed between us, then for the purposes of the Contract and these Terms and Conditions, the Delivery Date will be deemed to be the last Working Day of the usual Delivery week. Your order will be fulfilled by the Delivery Date. You hereby agree that the Delivery Date will be a date falling after 30 days from the date of the Order Confirmation, unless a bespoke product is said to take longer to create. Delivery of all ordered Products shall be to an accessible address, acceptable to our delivery couriers..
Failure to accord with the terms of clause 8.3 above may result in additional storage charges becoming payable by you. In the event that delivery has been declined. We reserve the right to charge you a storage charge for each day after the Delivery Date which We are holding your purchased Products unless otherwise waived by Us. This will be charged at a rate of £10 per day as varied from time to time. We will confirm the rate to you on the Order Confirmation and/or on the first Working Day following the Delivery Date. Storage charges shall be charged weekly in arrears to the card you used when making your original order payment. In the event that payment is unsuccessfully taken from this card, you will be contacted directly to provide payment by another credit or debit card or by such other means as agreed by Us. The Products will be your responsibility from the Delivery Date. Ownership of the Products will only pass to you when We receive full payment of the purchase price of the Products set out in the Order Confirmation. The price of the Products will be as quoted on Our Website from time to time, except in cases of obvious error. Product prices include VAT which shall be charged at the VAT rate in force at the date payment is taken by Us. Product prices are liable to change at any time, but changes will not affect orders in respect of which We have already sent you an Order Confirmation. Our Website contains a number of Products and it is always possible that, despite Our best efforts, some of the Products listed on Our Website may be incorrectly priced. We will normally, at Our discretion, either contact you for instructions before issuing the Order Confirmation and taking payment, or reject your order and notify you that We are rejecting it. Payment for all Products and any storage charges (unless otherwise agreed) must be by credit or debit card. We accept payment with American Express, Mastercard, Visa, Solo, Electron and Visa Debit. We will not charge your credit or debit card for Product orders until We have issued an Order Confirmation notice to you. Payments for any storage charges arising will be made in accordance with clause 8.5 above. We will only accept orders for items which are currently showing as "In-Stock" on Our Website when you place your order. In the event that a Product is listed as being "In-Stock" at the time you place your order but is subsequently found by Us to either be out of stock or is found to be of unsatisfactory quality prior to the Collection Date, We will notify you immediately by email and/or post and if for any reason We are unable to fulfil your order by the Collection Date, We will refund the price paid by you at that time in accordance with the terms of Our refund policy set out in clause 11 below. Notwithstanding any other rights We may have (which are specifically reserved), in the event that We are unable to take full payment of any Products ordered by you from your specified account on or after the date We issue the Order Confirmation to you, We reserve the right to cancel the Contract forthwith and/or suspend any further delivery of Products to you. We will use all reasonable care to ensure that all information provided by you to Us in connection with your order is kept secure. In the event that you may suffer any loss through a third parties unauthorised access to any data you provide Us when accessing and ordering from Our Website, We cannot be held liable for that loss unless it is solely due to Our negligence. because you have cancelled the Contract between Us within the 2 day cooling-off period in accordance with clause 7.1 above, We will process the refund due to you as soon as possible and, in any case, within 30 days of the day on which you gave Us notice of cancellation. In this case, We will refund the price of the Product in full however, you will be responsible for the cost of returning the item(s) to Us. We warrant to you that on the Delivery Date any Product purchased from Us through Our Website will conform in all material respects with its description, be of satisfactory quality, and be reasonably fit for all the purposes for which products of that kind are commonly supplied. Subject to clause 13.3, if We fail to comply with these Terms and Conditions, We shall only be liable to you for the purchase price of the Products and, subject to clause 13.2, any losses that you suffer as a result of Our failure to comply (whether arising in contract, tort (including negligence), breach of statutory duty or otherwise) which are a foreseeable consequence of such failure. However, this clause 13.2 will not prevent claims for loss of or damage to your physical property that are foreseeable or any other claims for direct loss that are not excluded by categories 13.2.1 to 13.2.6 inclusive of this clause 13.2. Applicable laws require that some of the information or communications We send to you should be in writing. When using Our Website, you accept that communication with Us will be mainly electronic but may also be by post. We will contact you by e-mail or provide you with information by posting notices on Our Website. For contractual purposes, you agree to electronic means of communication and you acknowledge that all contracts, notices, information and other communications that We provide to you electronically comply with any legal requirement that such communications be in writing. This condition does not affect your statutory rights. All notices given by you to Us must be sent to 294 Oldfield Lane North, Greenford, UB6 8PS or by email to hello@bluefeatherdesigns.co.uk. We may give notice to you at either the e-mail or postal address you provide to Us when placing an order, or in any of the ways specified in clause 14 above. Notice will be deemed received and properly served immediately when posted on Our Website, 24 hours after an e-mail is sent, or 3 days after the date of posting of any letter. In proving the service of any notice, it will be sufficient to prove, in the case of a letter, that such letter was properly addressed, stamped and placed in the post and, in the case of an e-mail, that such e-mail was sent to the specified e-mail address of the addressee. Transfer of rights and obligations. When placing your order, you will be asked if you want to receive any ‘special offers and news updates’ from Us. If you don't want to, just tick the 'unsubscribe' box when registering for an online account with Us. You are able to opt out at any time by following the "opt out" procedure detailed at the bottom of each email sent to you. No waiver by Us of any of these Terms and Conditions will be effective unless it is expressly stated to be a waiver and is communicated to you in writing in accordance with clause 14 above. Nothing in this clause 21 limits or excludes any liability for fraud. We endeavour to ensure that the information on Our Website is correct. We do not however warrant the accuracy and completeness of the material on Our Website. We may make changes to the material on Our Website or to the Products and prices described on it at any time without notice. The material on Our Website may at any time be out of date, and We make no commitment to update such material. The material on Our Website is provided on an "as is" basis, without any conditions, warranties or other terms of any kind. Accordingly, to the maximum extent permitted by law, We provide you with Our Website on the basis that We exclude all representations, warranties, conditions and other terms (including, without limitation, the conditions implied by law of satisfactory quality, fitness for purpose and the use of reasonable care and skill) which, but for this legal notice, might have effect in relation to Our Website. modify the paper or digital copies of any materials you have printed off or downloaded in any way, and you must not use any illustrations, photographs, video or audio sequences or any graphics separately from any accompanying text. Unless otherwise stated, the copyright and other intellectual property rights in all material on Our Website (including without limitation photographs and graphical images) are owned by Us or Our licensors. Any use of extracts from Our Website other than in accordance with clause 26.1 above for any purpose is prohibited. If you breach any of the terms of this clause 26, your permission to use Our Website automatically terminates and you must immediately destroy any downloaded or printed extracts from Our Website. Subject to clause 26.1 above, no part of Our Website may be reproduced or stored in any other website or included in any public or private electronic retrieval system or service without Our prior written permission. If you print off, copy or download any part of Our Website in breach of these terms and Our Policies, your right to use Our Website will cease immediately and you must, at Our option, return or destroy any copies of the materials you have made. 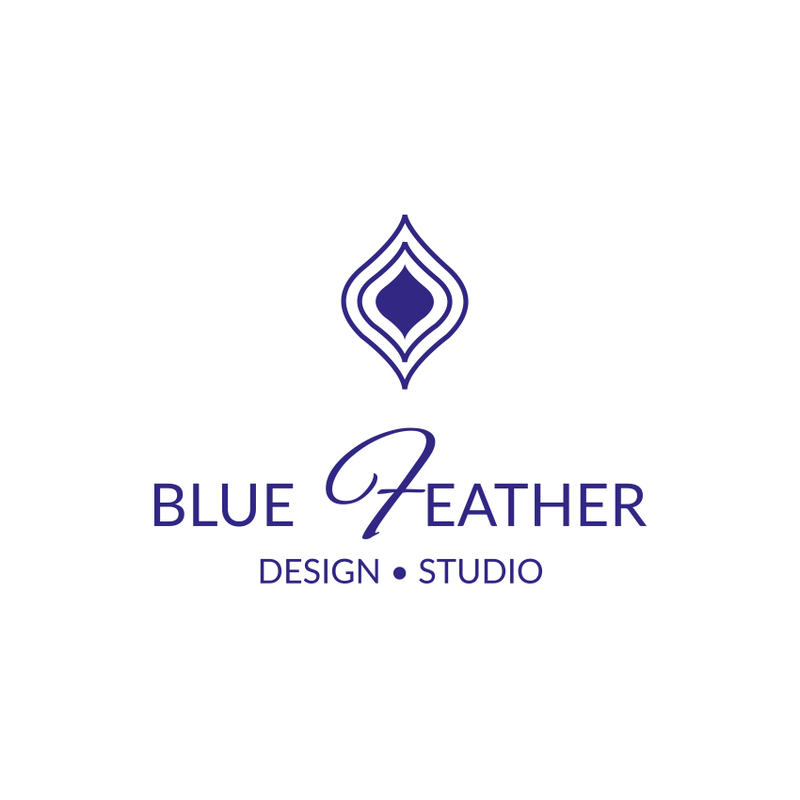 the Products will not be resold using the name "Blue Feather Design Studio" or any artists registered with Blue Feather Design Studio through contract. We have the right to revise and amend these Terms and Conditions from time to time to, including but not limited to, reflect changes in market conditions affecting Our business, changes in technology, changes in payment methods, changes in relevant laws and regulatory requirements and changes in Our system's capabilities. You will be subject to Our Policies and these Terms and Conditions in force at the time that you order Products from Us, unless any change to Our Policies or these Terms and Conditions is required to be made by law or governmental authority (in which case it will apply to orders previously placed by you), or if We notify you of the change to Our Policies or these Terms and Conditions before We send you the Order Confirmation (in which case We have the right to assume that you have accepted the change to the Terms and Conditions, unless you notify Us to the contrary within 7 Working Days of delivery of the Products).